ST. LOUIS, Dec. 27, 2012 -- Boeing [NYSE: BA] has received a $145 million order from the U.S. Navy for two additional C-40A Clipper transport aircraft, increasing the service's ability to move military personnel and cargo around the world. The modified Next-Generation 737-700 aircraft will be the 13th and 14th C-40As in the Navy's Unique Fleet Essential Airlift Replacement Aircraft Program, which is replacing the Navy Reserve's aging fleet of DC-9-based C-9B Skytrains. "The C-40A offers superior performance and range, 21st century avionics and quiet, fuel-efficient engines, and is increasing the Navy's capability for rapid response," said Andy Reheis, Boeing Global Transport and Executive Systems program manager. "Boeing looks forward to continuing our support of the Navy and meeting the service’s airlift needs." The C-40A is certified to operate in an all-passenger configuration, an all-cargo variant, or as a "combi" that accommodates both cargo and passengers on the main deck. 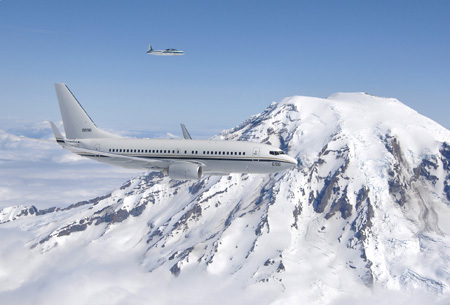 The Boeing 737 aircraft in the C-40A program are manufactured by in Renton, Wash., and sent to the company"s facility in San Antonio for modifications and certification. Boeing delivered the first C-40A to the Navy Reserve in 2001. Boeing also provides contractor logistics support for the C-40A fleet with industry partners Delta Technical Operations and J.K. Hill and Associates. A unit of The Boeing Company, Boeing Defense, Space & Security is one of the worlds largest defense, space and security businesses specializing in innovative and capabilities-driven customer solutions, and the world's largest and most versatile manufacturer of military aircraft. Headquartered in St. Louis, Boeing Defense, Space & Security is a $32 billion business with 60,000 employees worldwide. Follow us on Twitter: @BoeingDefense.